Sea Isle Village one bedroom one bath with 2 full beds; Has a full kitchen, Living room and Dining area. Sleeps 4. Has WiFi. (No Pets). 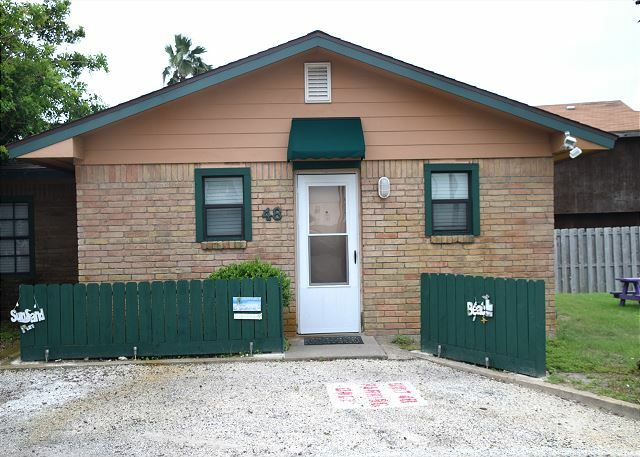 Nestled in on the back of Sea Isle Village sits this little bungalow condo. This condo gives you a private setting from the rest of the condos. When you walk in the first thing you will notice is the newly remolded and well equipped kitchen. The kitchen overlooks the dining room and living room with an open floor plan. The living room is a perfect place to sit back and relax after a fun day at the beach. Weather watching your favorite show or movies the 40” flat screen TV can swivel so all can enjoy. 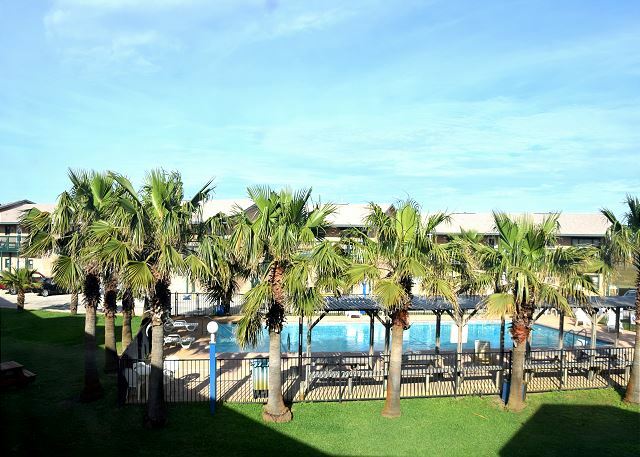 This unit features a master bedroom with two full size beds that will comfortably sleep four. 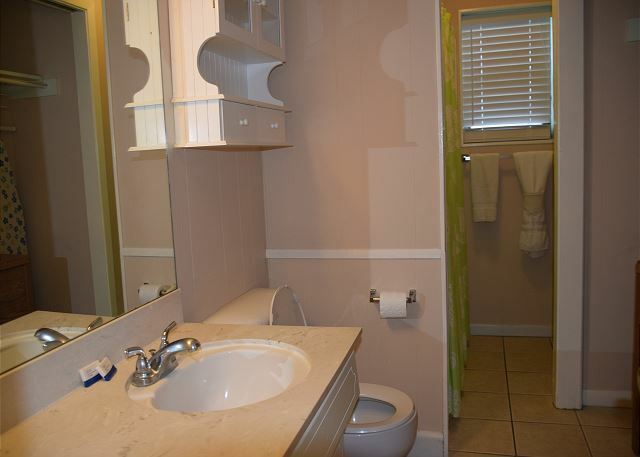 The master bathroom has a large closet and plenty of storage space. 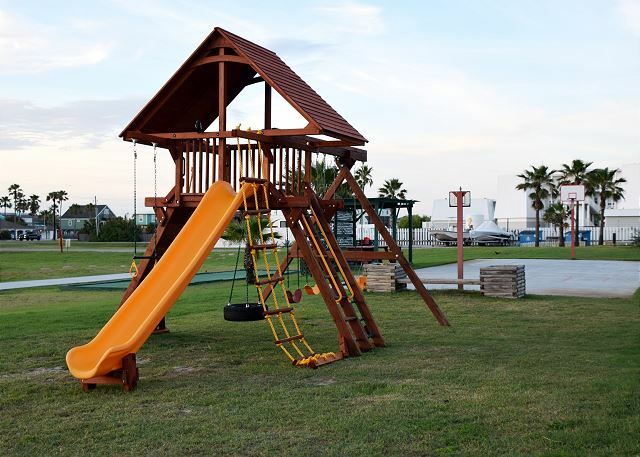 There is a picnic table and BBQ grill located just outside of the front door overlooking our recreational area. A friendly game of basketball, bocce ball, shuffle board or horseshoes is always a fun family time. 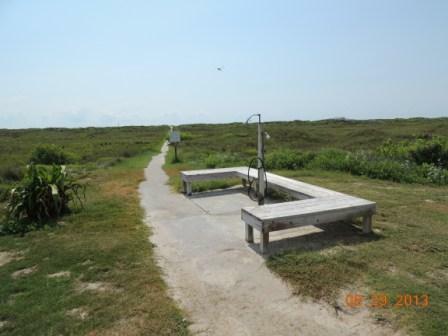 Our beach walk leading to marker #3 is located just across from our large swimming pool. It was clean, cute and absolutely perfect! Hope to say there many times in the future! It was good, I do think the bath rub needs to be unclogged taking showers my bathtub would fill up , also, they should have a sign that says parking for the certain condominiums there was no parking in front of our house condo. The unit was as described so no complaints. However I felt they could've said the walk to the beach is quite lengthy and does not include a boardwalk over the dunes. It starts out as cement and then turns into a sand path just before the dunes, then you have to cross a two-way road on the public beach. Therefore it IS walkable but not if you're pulling a wagon or have heavy items in my opinion. The house itself had adequate towels in the bathroom, travel size shampoo and hand soap. Bring trash bags and any cooking seasonings you will need! There is a laundromat on site and not far from unit, the cost is $3.00 to wash and dry one load. There is no quarter machine on-site that I saw either so come prepared. I had an issue woth nosisey vent in bedroom the 1st night. Emailed them the next morning and they came to fix that same day. We also managed to lovk ourselves out once and they were on-site within 20 minutes to let us in (on a holiday no less). The maintenance staff was very quick to respond and resolve the issues. Close proximity to town. Overall I have no complaints. As a valued guest, we appreciate your feedback and are sorry to hear you had a few issues. The access to the beach was a little lenghty if you have a wagon full of supplies, we also have spoken with the management team in Sea Isle Village to upgrade a few problems you mentioned. With a spirit to serve, we take great pride in not only meeting, but exceeding your expectations. Had a great time! We love to stay in the Surf Shack every time we visit. Everything is always in order. The Mother's day gift made my wife happy. Tammy in the office was a great help in anything we needed. The beach is just a short walk away. And the best part was we got to witness a Sea Turtle laying eggs by the dunes! As a valued Guest, we appreciate your feedback and are delighted to hear that you had a great stay.We are glad to hear your Wife enjoyed our Mother's Day gift we provided at our properties. With a spirit to serve, we take great pride in not only meeting, but exceeding your expectations. Wonderfull place to stay.very clean,everything we needed for relaxing stay. Thank you for sharing your experience at Life in Paradise Vacation Rentals, and appreciate your loyalty. As a valued guest, we appreciate your feedback and are delighted to hear that you had a great stay. With a spirit to serve, we take great pride in not only meeting, but exceeding your expectations. We loved the place! Went to Port A for a quick trip with a couple of teens and this place had it all. We could walk to town and the beach. 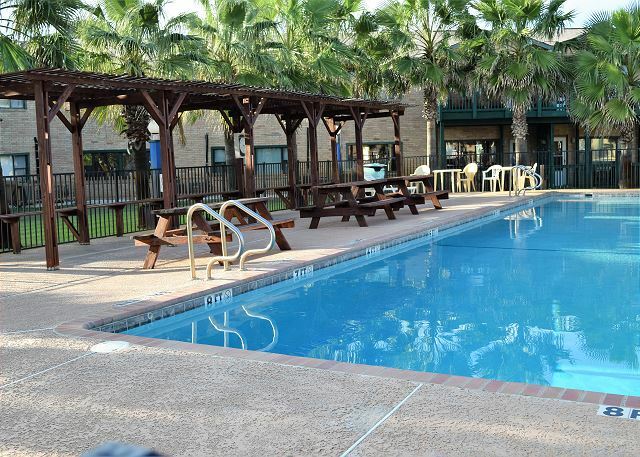 It was well maintained and had everything we needed. 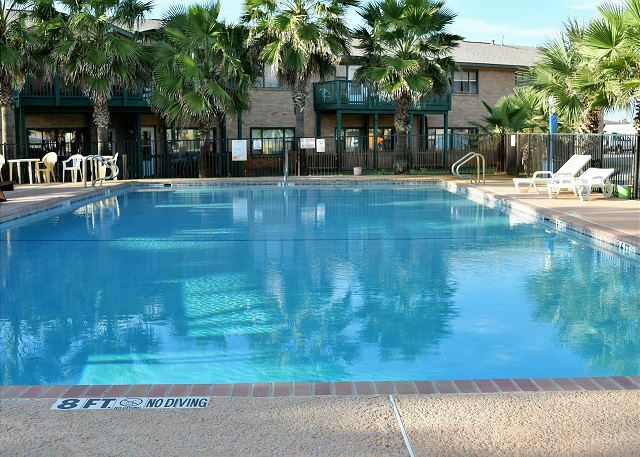 Condo was in a great spot and very well maintained. I would stay there again. Hello, Thank you for the review. We are glad you enjoyed your stay and we look forward to seeing you again. Follow us on facebook for future specials. Hello, Thanks for review. Glad you enjoyed your kids. follow us on facebook for future specials. Had a wonderful time, everything was great! Hello, Thank you for the review. Glad you had a wonderful time. Look forward to seeing you again. Follow us on facebook for future specials. The stay was great! We will definitely come back again. Was very disappointed with the cost of one night as it was hard to come to terms with walking in the unit and finding mouse dropping in every room. The room was cleaned the next day but the housekeeper was not very through. She seemed to be in a hurry. Hello, Thank you for your review. We are sorry you had minor issues at check in,but it was taken care of immediately and each time you requested an item or services it was taken care of right away by SIV Staff. We look forward to your 3 month visit is 2017. Minor complaints: dishwasher powder was caked, and Well we had no soap in bathroom. Also only had two rolls of toilet tissue. Not sure if we should have known to bring some... All in it was a great place to stay as we were there with two other families. A nice retreat. Very clean and well equipped. Great access to beach. Hello, Thank you for the review. Glad you enjoyed the time with the family. Hope to see you again soon. Follow us on facebook for specials. Extended stay. location was excellent. will stay again next year. Hello, Thank you for the review. Glad you enjoyed the extended stay. Look forward to seeing you again next year. Our vacation was nice. This unit is roommy. The kitchen was efficient. Close the beach short walk or drive. Would recommend and stay there again. The only thing is the floor in front of the bathroom doorway had water coming up from the boards looked like water was leaking down from the wall. I wasn't please with the beach access. Would have been nice if it wasn't so steep in places. Clean, comfortable, cool, and right by the beach. 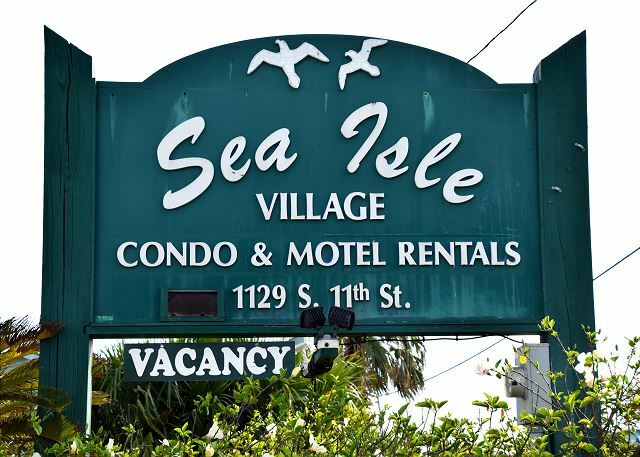 It was just what we were looking for and we'll be quick to stay at the Sea Isle Village our next time through. Hello, Thank you for you review. We are glad you enjoyed your stay. follow us on facebook for future specials. Hope to see you again soon. My girlfriend and I had a wonderful stay at Sea Isle #48. The kitchen was well-equipped with all necessary utensils and products, allowing us to do most of our cooking at home and spend more time at the beach. My only suggestion would be to add a small coffee table in the living room. Hello, Thank you for your review. We will give Sea Isle the suggestion for coffee table. We are glad you enjoyed your stay. Follow us on facebook for future specials. We look forward to seeing you again. Will definitely stay here again. Property has convenient boat parking and very clean unit. Hello, Thank you for your review. We are glad you enjoyed your stay and look forward to seeing you again. Hello, we are glad you enjoyed your stay. Hope to see you soon. We are glad you enjoyed your stay. We look forward to seeing you again soon.